For years, advocates have known that the Community Reinvestment Act, or CRA, helps low and moderate income communities gain access to financial services, loans, and community development investments that would otherwise be unavailable. Since 1996, over $2 trillion in community development, mortgage, and business loans were made by banks obligated to invest in their communities by the CRA. While the positive benefits of CRA have been evident, the question “What happens to lending when low and moderate income communities don’t have CRA as an enforcement mechanism?” was not well understood. 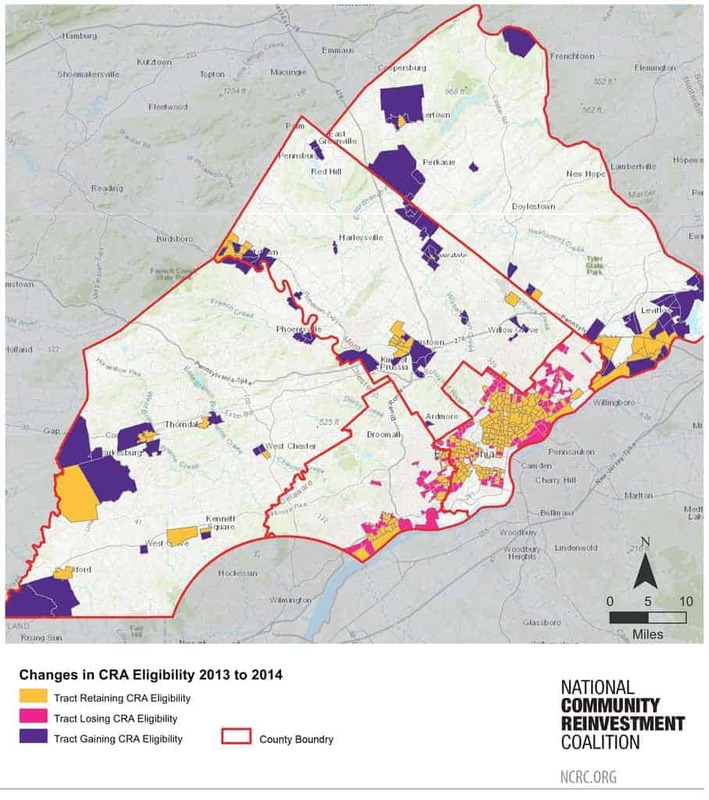 In 2014, many neighborhoods in Philadelphia lost their CRA eligibility, providing a way to test what happens when communities lose their CRA-credited investments. 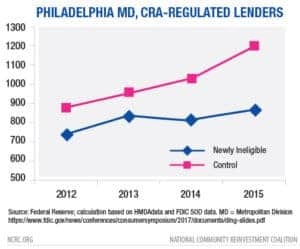 More than 100 Philadelphia neighborhoods lost CRA eligibility between 2013 and 2014 due to a redefinition of the federal guidelines. The map shows how these neighborhoods were clustered in Philadelphia and parts of Delaware County. The Philadelphia Federal Reserve studied the outcome of this loss of CRA eligibility. The result- there was a 20% reduction in mortgage lending by CRA covered banks in the first year. The graph shows the substantial decrease in lending between 2013 and 2014 compared to the areas where there was no change in eligibility. While some suburban neighborhoods gained CRA eligibility, the change resulted in a net loss for the entire region, resulting in less investment.